We are doing our best to compile as much information as possible before the season finale. If you are anything like us, then you are yearning for more details on what to expect during And Straight on ‘Til Morning. Now, we have talked about Greg and Tamara being guided by a “Home Office.” This may lead to the destruction of Storybrooke with the trigger in their hands. With that said, Colin O’Donoghue (Captain Hook) chatted with TV Line to give us a little scoop on what we may expect to see in the finale. TVLINE: What does the captain make of this strange boy? O’Donoghue: Well, he’s just managed to find this boy floating in the middle of the sea, so it’s kind of an intriguing thing. He’s interested in who he could be or where he comes from. TVLINE: I understand they find some things in common, as we get insight into Hook’s background. O’Donoghue: Yes, you learn a little bit through Bae. You learn a bit about where Hook was from and about his background. You get to find out more about Hook and how he became the person that he is. TVLINE: The scoundrel that he is. TVLINE: And what if Hook were to learn who Bae is? O’Donoghue: Well, it’s bound to have some effect on him, because of the history with Rumplestiltskin and Milah. TVLINE:What is Hook’s standing there in Neverland? What’s his relationship to that realm, to The Shadow, to the Lost Boys? What kind of dynamic will we discover? O’Donoghue: It’s going to be very interesting for people to see Hook in Neverland and see [cocreators Eddy Kitsis and Adam Horowitz’s] take on Neverland, because as you can tell from the way they’ve set up the other characters from other stories, everything’s not as it seems. As we know, [today’s] Captain Hook is very different than Hook from before. 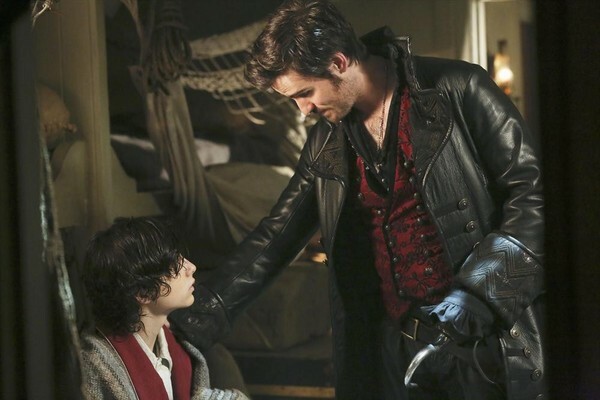 For Hook, going to Neverland — as we saw in the “Crocodile” episode — was very much about being able to take some time to figure out how to get his revenge on Rumpelstiltskin. That’s his reason for being there. But it’ll be interesting to see if and how he will interact with the Lost Boys or whomever in Neverland. TVLINE: Meanwhile in Storybrooke…. Is Hook still doing Tamara and Greg’s bidding? Last week, they seemed to leave a bad taste in his mouth. O’Donoghue: Hook is always out for himself, for the most part, so as long as Greg and Tamara can in some way get him to where he wants to be or help him out in his quest get revenge on Rumpelstiltskin or whatever it is, he’ll keep with it. But it’s not lost on Hook that he needs to make sure that he looks out for No. 1. He’s not particularly loyal to any one person — and certainly not Tamara and Greg, because they certainly go about their business in a bad way. TVLINE: When he opted out of hanging around for Regina’s torture, was that coming from a place of sympathy? Or was it purely because Greg wasn’t furthering his revenge agenda in that instant? O’Donoghue: There’s probably an element of both. In that case, there was maybe a bit of sympathy, because Hook is not an incredibly cruel person. He’ll do whatever it takes to meet his agenda, but I don’t think he particularly enjoys seeing somebody be tortured like that. TVLINE: If he does wind up “caught in the middle” there in Storybrooke, between the good guys and the bad, will decisions that he’s made in the past inform the decisions he makes now? O’Donoghue: In the finale you do get more of an in-depth look at his character. You see the layers that he has. He has it in him to be cruel at times, if that’s what he needs to do, but he also has the potential in him to be compassionate. Hook might have made a few bad decisions along the way, and he might feel like he should try to, in some way, make amends for them. Next Next post: Lana Parrilla’s Interview: What will Regina do in the Season Finale?